The High-fat Hep C Diet: Will a ketogenic diet increase the risk for malignant melanoma? It's well-known that ketogenic diets reduce the growth of some cancer types in humans. These are early days for learning which cancer types are most vulnerable, which diet is best, and what the mechanisms are; Warburg had a clue, but the Warburg effect is far from the whole story. On the other hand, there are cancer types that may not respond to a ketogenic diet. Prostate cancers seemed a likely candidate, because there is an inverse correlation with type 2 diabetes, but in animal models a ketogenic diet improves survival. But recently some U.S. researchers have provided evidence that acetoacetate accelerates the growth of an important type of malignant melanoma, cells with a BRAF V600E mutation. We recently reported that the ketone body acetoacetate selectively enhances BRAF V600E mutant-dependent MEK1 activation in human cancers. 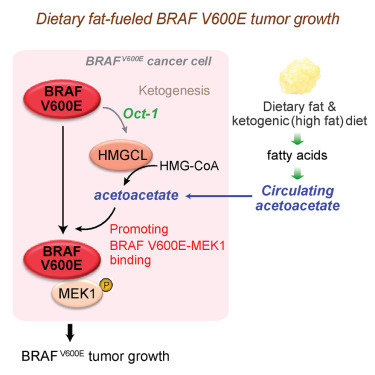 Here we show that a high-fat ketogenic diet increased serum levels of acetoacetate, leading to enhanced tumor growth potential of BRAF V600E-expressing human melanoma cells in xenograft mice. Treatment with hypolipidemic agents to lower circulating acetoacetate levels or an inhibitory homolog of acetoacetate, dehydroacetic acid, to antagonize acetoacetate-BRAF V600E binding attenuated BRAF V600E tumor growth. 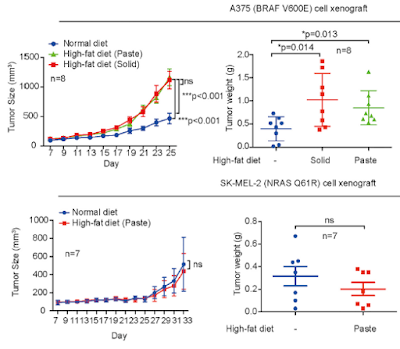 These findings reveal a signaling basis underlying a pathogenic role of dietary fat in BRAF V600E-expressing melanoma, providing insights into the design of conceptualized “precision diets” that may prevent or delay tumor progression based on an individual’s specific oncogenic mutation profile. I have some issues with this - firstly, that "Dietary fat promotes ketogenesis to enhance BRAF V600E tumor growth." Dietary fat will only do this in a ketogenic diet. It doesn't take much carbohydrate and/or extra protein to stop it. Fasting or a very low calorie diet will promote ketogenesis too; the rate of oxidation of fat when you skip carbohydrate and restrict protein is exactly the same as when you don't eat, except that ketone levels stay lower over the longer term. So if ketone bodies from fat oxidation promote melanoma, fasting should be worse than a ketogenic diet. Obesity and type 2 diabetes are conditions that suppress ketogenesis and make it hard to get into ketosis. They are the opposite of fasting. They should be protective against malignant melanoma; they're not. However, the relationship is weak and inconsistent, which might show some effect, countering the usual pro-cancer mechanisms in these conditions. Type 1 diabetes is a condition that frequently exposes people to high ketone levels. Type 1 diabetes seems to be inversely, but non-significantly correlated with melanoma in Sweden, standardized incidence rate of 0.8 (0.5 to 1.1). This evidence doesn't refute the ketone-melanoma link in humans, and it doesn't relate to ketogenic diets, but it does show that there are many influences on melanoma (deficient vitamin D3 and hyperleptinaemia, and glutamine as a fuel, appeared in a cursory search) that might swamp the ketone effect. One of the findings in the latest study was that cholesterol increased in the mice on the ketogenic diet. This is presumed to deliver more lipid to cells. Prostate cancer cells upregulate the LDL-receptor to take in more lipid. and the function of this is to take in more omega-6 fatty acids to make prostaglandins which promote tumour growth. This is relevant to the present case because polyunsaturated fatty acids are especially ketogenic; however, the fat used in this experiment was a mixture of 1 part corn oil to 6.5 parts Primex, which is "pure vegetable shortening, a mixture of partially hydrogenated soybean and palm oil". None of these are fats that anyone on a ketogenic diet would use, and all, it turns out, are contaminated with carcinogens. However this would have had little effect in the context of this experiment. 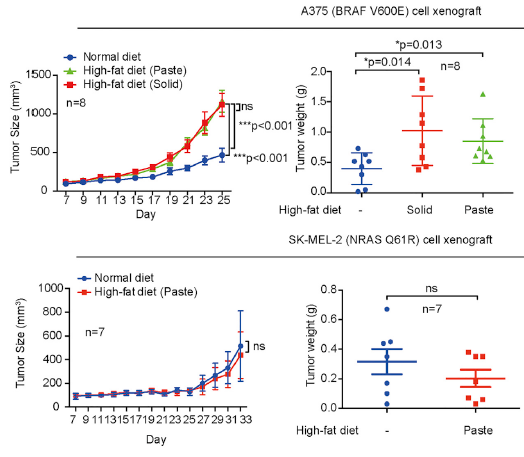 This dodgy version of a ketogenic diet did not increase tumour size in the mice with the alternative malignant melanoma mutation. This paper summarizes the emerging literature indicating that at least two polyunsaturated fatty acids (PUFA; linoleate, alpha-linolenate) are moderately ketogenic and that via ketone bodies significant amounts of carbon are recycled from these fatty acids into de novo synthesis of lipids including cholesterol, palmitate, stearate and oleate. This pathway (PUFA carbon recycling) is particularly active in several tissues during the suckling period when, depending on the tissue, >200 fold more carbon from alpha-linolenate can be recycled into newly synthesized lipids than is used to make docosahexaenoate. At least in rats, PUFA carbon recycling also occurs in adults and even during extreme linoleate deficiency. We have many thousands of people around the world using various types of ketogenic diets or fasting, some for a very long time (lifetimes in the case of some people with pediatric epilepsy), and a large proportion of them nowadays are relatively sceptical about sunscreen. There are no case studies of melanoma in such people that I could find, and I have come across no reports in many years on social media. This is not to say that a ketogenic diet or fasting is a treatment option for BRAF V600E melanoma, this is I think good enough evidence to decide that it's probably not. However, it's likely that other benefits of keto diets and fasting, viz. improved insulin and leptin status, decreased inflammation, lower glutamine, improved vitamin D status, hormetic antioxidants, avoidance of refined oils and a good omega 3:6 ratio, etc. decrease all the other changes that lead to a tumour's appearance in the first place. The research I cited here has received ample funding from an impressive array of sources, but not all ketone-and-cancer research receives public funding. Thus E.J. Fine and R.D. Feinman are now crowd-sourcing funding for a simple experiment, certainly much less expensive than the one above, which is testing the effect of acetoacetate on a variety of different cancer cell types and looking at the metabolic pathways associated with response and non-response, specifically those that control ROS generation and cytotoxicity. Our 28 day pilot human trial of 10 subjects with advanced cancers on a very low carbohydrate ketogenic diet (KD) was publilshed in Nutrition (Elsevier) in 2012. Patients with the greatest extent of ketosis had stable cancers or partial remission, while those with the least ketosis showed continued progressive cancer. In cell culture studies we published that ketone bodies (KB) inhibited growth of 7 different cancers from 20-50%, leaving normal cells unaffected. Despite a favorable editorial & the Metabolism Award, our proposal to scale up to 65 patients & extend our cell culture work was rejected by the NIH/NCI, as they are committed to drug therapy. We appeal now to people who are interested in supporting promising dietary cancer research. You can donate here https://experiment.com/projects/part-2-can-low-carbohydrate-ketogenic-diets-inhibit-cancers or support the project by buying a cool T-shirt here. Zendehdel K, Nyrén O, Östenson C-G et al. Cancer Incidence in Patients With Type 1 Diabetes Mellitus: A Population-Based Cohort Study in Sweden. JNCI J Natl Cancer Inst 2003; 95(23): 1797-1800. Chen Y, Hughes-Fulford M. Human prostate cancer cells lack feedback regulation of low-density lipoprotein receptor and its regulator, SREBP2. Int J Cancer. 2001; 91(1):41-5. Cunnane SC. Metabolism of polyunsaturated fatty acids and ketogenesis: an emerging connection. Prostaglandins Leukot Essent Fatty Acids. 2004: 70(3):237-41.
rapid scientific advances occur when someone connects two fields that weren't connected before. E.g. astronomy and physics. Or, chronic diseases, nutrition, and paleoanthropology. Staffan systematised the connections hinted at by others, with experiments that made the links unbreakable. patterned according to certain mathematical formulae. I've been out of the loop, moving from NYC and setting new life in Vermont. Just had a set of bloodwork done and am a bit concerned, my not so blissful but at least ignorant frame of mind shaken. All this to say, if you have discussed this somewhere on your blog, point me the way. I will be reading up on what I've missed since in the last year. Cheers. I'll dig up the study and read it in detail, but I have a few thoughts. Cholesterol is protective in animal models of alcoholic liver disease, it takes very large doses no-one could eat to produce cirrhosis. The variation in cholesterol is not large, and probably relates to other more significant differences in diet - more cholesterol = more processed meat, fried food, alcohol, less antioxidants. There's no cholesterol in coconut oil. assessment (HOMA-IR) and prevalence of diabetes. It could not possibly cause these things, yet they would contribute to the risk of cirrhosis. They would also over-ride the normal adjustment to dietary cholesterol, because insulin stimulates the liver to make cholesterol. I think you don't need to worry about it if you have a diet that lowers insulin - excess insulin contributes far more cholesterol to the liver than diet does. So why was there ZERO correlation between high cholesterol intake and cirrhosis in men, yet a strong one in women? Maybe relates the the types of food eaten, women eating cholesterol in pastries and baking, men in eggs and meat. Or is purely due to chance - if it's toxic to women it can't have no effect at all in men. A lesser effect, yes, but no effect, that seems completely implausible. Thanks for that study, see my posts on NASH and cholesterol for background - but remember most cholesterol in the liver is made a) from glucose under the influence of insulin b) from linoleic acid (omega 6) when it's eaten. Do you have thoughts as to which types of cancer might grow with a ketogenic diet? I'm specifically interested in CLL (chronic lymphocytic leukemia). Having seen several of Dr Seyfried's and Christoffersen's article and clips about ketosis inhibiting cancer - but also having read Paul Jaminet and Terry Wahls recommendations that it be used only in aggressive cancers and/or before chemo - I'm trying to research it fully. For example, if CLL is stable and has not progressed, one wouldn't want to wake the sleeping beast inadvertently by jumping into ketosis. however completely avoiding gluten grains seems a very safe bet, that would be one benefit of a keto diet. Sorry I can't give you more info than this - there are so many types of cancer and not enough studies like the one above that differentiate between them. It seems to so far be only the BRAF V600E melanoma that this applies to - indeed I've seen a report of animal studies in which melanoma was one that responded well to the ketogenic diet, and can only assume that BRAF V600E wasn't involved. Thanks George for the info on lymphocyte response. 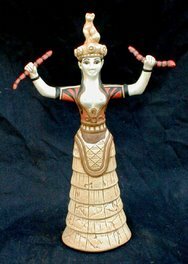 I will keep looking to see if there was any follow up work since that is an older article. Wow. I think KD would very likely reduce metastasis of CD36 expressing tumours by lowering serum palmitate, especially if relatively low in palmitic acid - e.g. coconut oil, olive oil etc. your blog post http://galinaleb.com/ketogenic-diet-increase-the-risk-for-malignant-melanoma/. Thank your George. It looks like no one besides you has take the trouble to discuss the issue. Great! I had fun rereading it in Google translate. Thank you very much for this post, George! You've pointed out some important issues with this article. I want to bring to your attention another flaw in this study. According to (at least) this study http://www.ijcem.com/files/ijcem0016658.pdf, unlike humans, mice show a significant increase in blood glucose levels when fed a high fat diet. Humans do show a decrease. That means, that human melanoma cells in this study were, most probably, exposed to an environment with plenty of accessible glucose to fuel their growth, unlike what would happen in a human on a ketogenic diet, where low blood glucose levels might easily overcome any possible effects of acceleration due to acetoacetate (ketone) pathway activation. Applying this study's results to humans is no more smart than applying to people results of studies that found high-fat diet/high cholesterol link in rabbits. IMHO.